Nestled in the rolling hills of Western Pennsylvania, lies the Crooked Creek Horse Park. 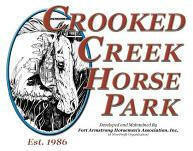 Please visit and see what this gorgeous park has to offer for the horse enthusiast. At Allegheny Valley exit take 28N for 30 miles towards Kittanning. Watch for Ford City, Rte. 28N, 422E and Rte. 66 signs. After crossing the Allegheny River, exit to the right off bridge on 66S to Ford City. Watch signs carefully as 28 and 422 go straight ahead. FOLLOW MAP - at this point you are about 4.6 miles from the horse park. FROM PA TURNPIKE – EXIT 8 At New Stanton take Toll Road 66N for 14 miles. Toll Road ends at Delmont. Continue on 66N for 12 miles thru Apollo and North Apollo. At stop light in N. Vandergrift turn right on ALT 66. Follow Alt 66 about 10 miles back to 66. FOLLOW MAP – at this point you are about 2 miles from the horse park. FROM I-80 EXIT 10 TRAVELING EAST Rte 66S for 12 miles to New Bethlehem. Rte 66 and 28S for 20 miles towards Kittanning. Exit towards Ford City before crossing river. FOLLOW MAP - at this point you are about 5 miles from the horse park. FROM I-80 EXIT 10 TRAVELING WEST Rte 28S for 40 miles towards Kittanning. Exit towards Ford City before crossing river. FOLLOW MAP - at this point you are about 5 miles from the horse park. FROM I-79 EXIT 29 – Rte 422E From I-79 Take Rte 422 E for 34 miles towards Kittanning. After crossing the Allegheny River, exit to the right off the bridge on 66S to Ford City. Watch signs carefully as 28 and 422 go straight ahead. FOLLOW MAP - at this point you are about 4.6 miles from the horse park.